Expect an explosion of colour as dancers, stilt walkers and fire performers bring the carnival spirit of Rio to this unique private island! Situated 1.4 miles off the Isle of Wight, this inspiring private island in the Solent is a fabulously unique destination. 3 times the size of Spitbank Fort, No Man's Fort suits those who are looking for the ultimate party venue or a fun, romantic getaway. Boasting its own lighthouse with spectacular views across the Solent, the fort appeared in the 1971 Dr Who episode ‘The Sea Devils’ with Jon Pertwee and is the perfect base for exhilarating RIB rides, yachting & water sports. Newly opened in Spring 2015, No Man’s Fort is the latest addition to the Solent Forts collection and offers an unrivalled, unique experience. 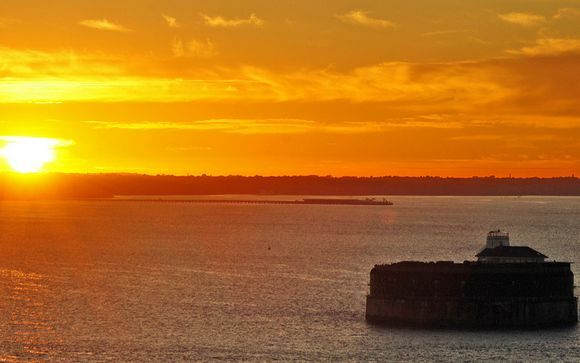 Built between 1865 and 1880, No Man's Fort was designed to protect Portsmouth from attack and is now a luxury space for those seeking an exclusive sanctuary. With four floors packed with a variety of amazing facilities – it’s an exciting venue that’s sure to fire people with enthusiasm and leave them with unforgettable memories. This magnificent sea fortress is brimming with a variety of unusual things to see and experience - there is something for everyone. Boastings its own hot tub, choice of bars, large sun deck, billiards room and more, this is a truly unique getaway that offers thrilling activities*, including RIB rides, jet biking, sea kayaking, or kite surfing (*must be booked prior to arrival). Be greeted with a stunning champagne reception and enjoy delicious canapés as you explore the Fort and experience this unique taste of life at sea. Listen out for the siren and head to the wonderfully carnival themed Mess Dining Hall for a spectacular four course dinner followed by a disco with music provided by the fort's incredible DJ. Enjoy the beautiful panoramic view from the rooftop fire pit and sample a cocktail (or two!) expertly prepared by their mixologist. 17:30 - Check in at their new Port Office in Gunwharf Quays (near to Old Custom House and Café Rouge). 18:00 - Boat departs for No Man’s Fort for an evening of exciting carnival entertainment. Enjoy a champagne reception, canapés and performances from Manic Stage Productions. Indulge in a lavish four course banquet and then dance the night away on the rooftop to the sounds from the resident DJ. Please note all tables are party sharing tables, unless otherwise stated. 08.30 - Enjoy a wonderful, full English or Continental breakfast. 10:00 - Time to head back to land via the wonderful Spitbank Fort. 10:30 - Arrival at Gunwharf Quays Port Office. This offer is based on an Executive Room. 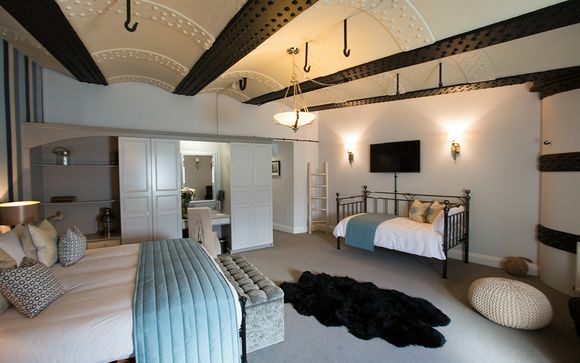 These spacious executive rooms are luxuriously furnished, offering their own unique character and style, showcasing historical sea fortress features. Boasting spectacular sea views, each room has a seating area and a large slate finished shower room. Transfers are included. You will be transferred from the new Port Office in Gunwharf Quays directly to No Man's Fort.